Flatcars with modern miltary equipment? Thread: Flatcars with modern miltary equipment? I'm new to the forums and I don't know if this has been asked before. If it has been asked before then my apologies. From some of the replies I have seen when a newbie ask redundat questions I ask that you not try to snap my head off please. RE: Flatcars with modern miltary equipment? Thanks Thomas. :) I already have this one and I enjoy it very much. More than anything I'm looking for some modern tanks and military transport trucks on flats. I would like to see some M-48 tanks to do some activities using F-7's over ATSF tracks. i took some screen shots from the Pentrex Dvd ATSF across Arizona where several military cars were at the back of a pig train. There were only water carriers and APC's on the train. Any one wanting the shots I will be glad to send them when I get back home in a couple of days. I have not tried it, but it should be possible to take a military model that has been exported as a .s and add it to a flatcar using FreightAnim in the wag file. 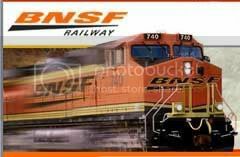 I noticed that BNSF's new railfan security program specifically includes in their guidelines: "Do not take photographs of military trains and equipment". OK, since I think their program is good idea and good for railfan relations, I'll go along with that, but it seems a bit pointless. I guess there could be some super-secret weapons riding uncovered on open load flat-cars.